Behold...the following pictures below was the coolest creation done with the help of Jon, DK and Me!!! Thanks guys for this wonderful creation!!! Simple and easy... this technique was found by accident a week back when i was at Rasta for supper with Jon, William, Frances and a few other friends. 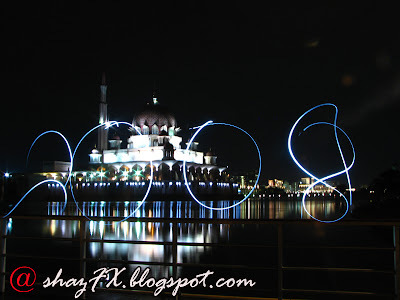 We were just playing around with shutter speeds and light! Oooh... then we found out that we can make a lightsaber out of it! Or more like it was Jon's idea... but hey!!! 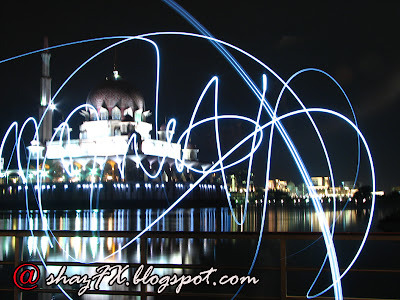 This night, at Putrajaya, we decided to use Daniel's sort of torchlight that came with his SE phone... how did we do this? 1. Place your camera on a tripod (turn the dial to Shutter Priority or Manual Mode). Ensure the shutter speed is long enough (i.e: 8seconds, 12seconds, 15seconds depending on how much time you need to draw what you want to draw). 2. Compose your shot...frame it up! Ensure enough space for you to stand in front of the camera...(not too close, not too far away). 3. Use some kind of light emitting device (i.e. 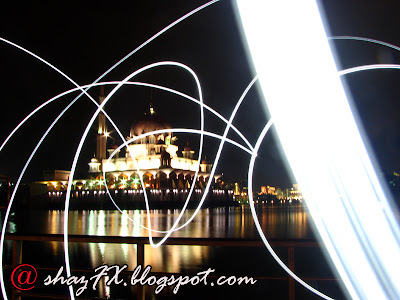 : torchlight, phone light) and set your camera on a 2 second timer. 4. Once the timer goes off, and the picture is currently being taken - switch on ur light (or let the light be on but cover the light with your hand and only reveal the source of light when you want to draw your picture / trail). 5. You may draw whatever you want... just ensure that you cover the light where you want it to be dimmed or not appear in your photo... get out of the frame as fast as you can and ensure there's no other sources of light nearby you. And you'll get pictures such as this...(this is a bit blurry because i didn't place it under the 2 second timer). Those photos are very nice! Its interesting that the humans disappear but the light remains .. hehe .. really cook effects man! Anywayz, thanks for the tips yo! I was there too! With MY light!